Today I came across Boostnote (https://boostnote.io). A cute app for organising notes in text files. It looks quite close to Bear Writer but sports some additions I like like preview of markdown and more way to organise notes. 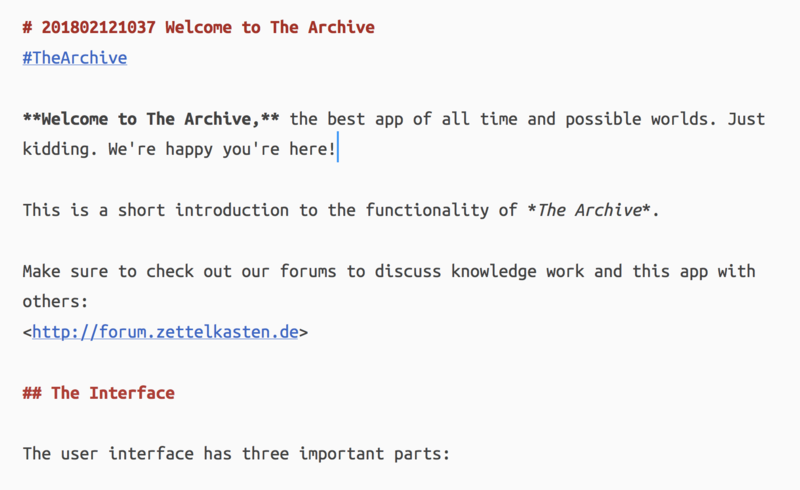 Currently I'm still using The Archive on a regular basis for my Zettelkasten. But I'm tempted to move to Boostnote once it sports an iOS app again. It's text based but at the same time "higher fidelity". Good to see there's development on the note-taking front in 2018. Can you explain what "higher fidelity" means in this context and for your kind of use? Note how the referenced video is shown right inside the zettel. And the image below that was pasted from the clipboard. 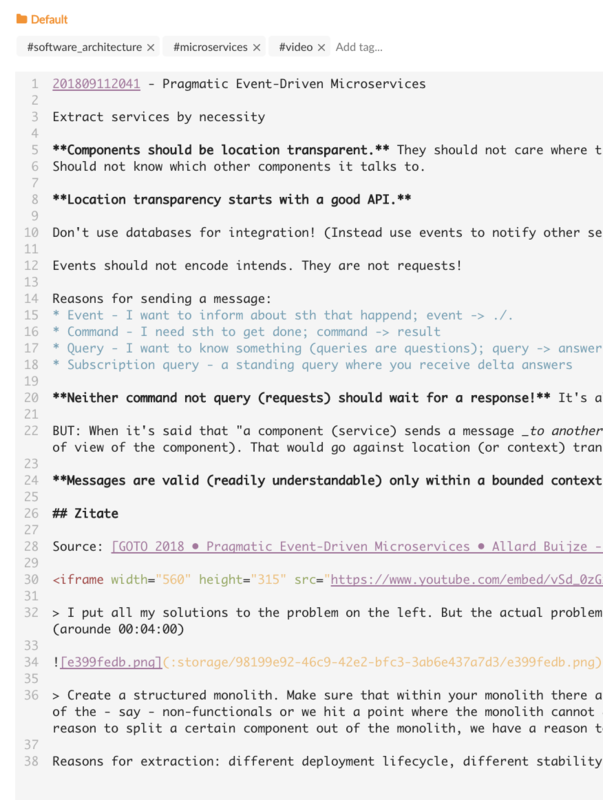 Using plain text notes with markdown is great. But it helps reading them if the markdown actually is transformed in some way so the annotations make a visual difference. That's what I call "higher fidelity". A Zettelkasten is supposed to be a "second brain". It needs to deal with all sorts of input. In 2018 we're far beyond what Niklas Luhmann was faced with. The input I want to build on comes from different media and has different formats (e.g. plain text or programming code). I don't make hand written notes anymore either. So what I expect from a Zettelkasten is that is caters to those needs. Using plain text with markdown helps to really own my notes (compared to them stored in a DB or in some proprietary format like .docx). But that should not limit the fidelity in which I record my thoughts and findings to just a plain text view. Why did you delete all the syntax in the second image? If you want to compare the syntax highlighting you need syntax on both sides of the comparison. You can access the welcome note that explains the app and its use a bit from the "Help" menu by selecting "Create Welcome Note". Not very high fidelity. It's a bit better, though, when I switch to a dark theme. 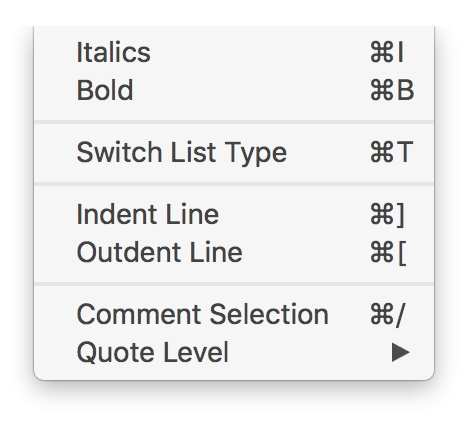 However: italics are not shown as italics, but just highlighted in some way. And an "embedded" rendering of the markdown is still missing. @ralfw, I think you may have changed the font to a fixed-width font like Monaco that neither supports bold nor italic characters. Try changing the font to something like Menlo, to see if the bold and italic formatting is working then. If you want your notes displayed in a more vibrant way, check out my PrettyFunctional (Regular) theme. The linked post contains some screenshots and instructions on how to install the theme. Don't get scared off by the amount of text, most of it is just background information. I just checked out Boostnote out of curiosity, but I am a bit disappointed. I was expecting it to use regular markdown text files, just like The Archive, nvALT, 1Writer, and tons of other apps do. But instead it saves notes as "proprietary" cson files that are not cross-compatible with other apps. This would be a huge deal breaker to me. It also does not not help that is an Electron app (basically a web app bundled with a web browser), instead of a proper native app. Well, if the automatic advice of The Archive is "We recommend fixed-width fonts for editing", who am I then to violate that? But agreed, the fidelity is now better with Menlo and highlighted markup. I'll leave the non-fixed-width font. Still missing, though, is a high fidelity view of a note and seamless support of media. As for the cson file format of Boostnote: To me most important is notes are stored in text files where I want them to be stored. The cson format is simple enough. If I want to actually work with my notes in some other way I can transform it any way I like. It's harder to parse unstructured text. I don't know why you mind an Electron app. Slack, GitHub Client and many more are Electron apps and are working nicely for me. Electron does not mean it requires internet access. I don't see much value in "proper native app" just in itself. There are lots of bad native apps on all platforms. Sorry, rereading what I wrote, I realize that that was a little ambiguous. Most fixed-width fonts do support bold and italic characters, only a few (like Monaco) don't. Menlo is actually also a fixed-width font, but one that does support bold & italics. That warning message to not use variable-width fonts is a bit ridiculous and heavy-handed, though. 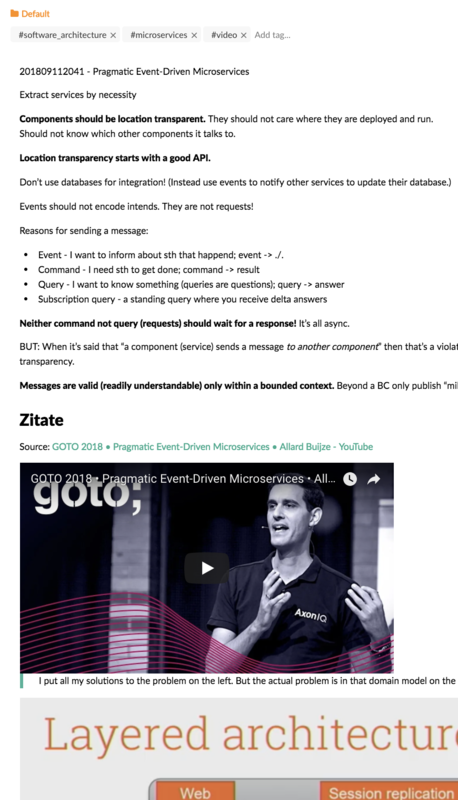 As I wrote in the theme thread I linked to, I vastly prefer a variable-width font for most of my note text (and a fixed-width font only for tables and code blocks). If you set up the "PrettyFunctional (Regular)" theme, you get the best of both worlds, as explained in that thread. Inline display of images is a planed feature, according to @ctietze, and I am eagerly awaiting its arrival, too. You are right that you could transform/convert your notes if you wanted to work with them in another app, but you could also run docx files through Pandoc to create markdown versions of your notes if you kept them in MS Word. It is however exorbitantly more convenient to be able to readily work with your existing notes without the need for conversions. 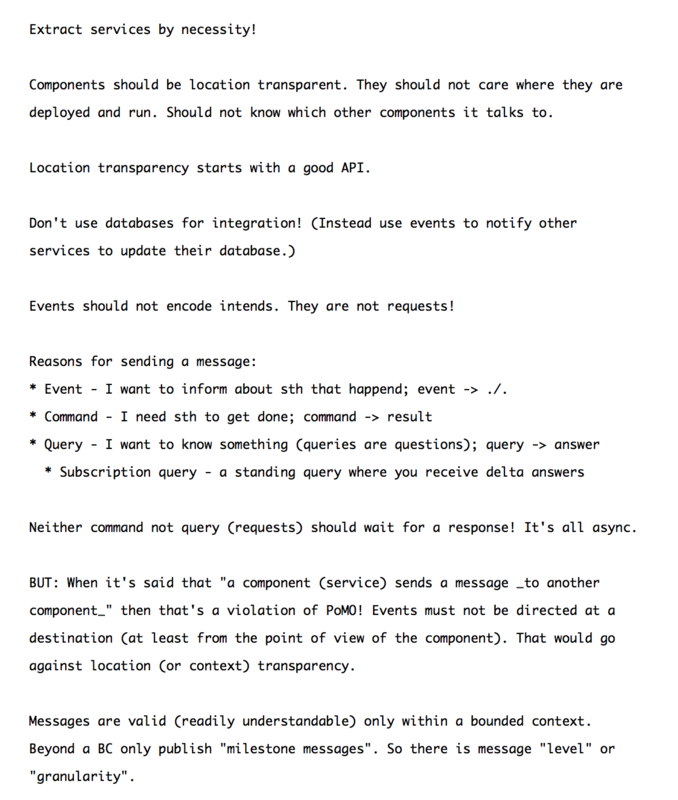 There is a gigantic universe of applications that support real plain text markdown note files. For instance, Calca is great if you want to do calculations within your notes; with Table Flip, you can very easily create and modify tables within your markdown files. Just to name a few. Funnily, if Boostnote used regular markdown text files, it would not be a problem at all that the iOS version is currently MIA. You could just use any of the existing markdown-based text editors that supports syncing via Dropbox or iCloud. There are probably hundreds of them and at least 5-10 are actually really good. The reason why a lot of Mac users dislike Electron apps is because they are generally are much more bloated / resource intensive (both in terms of memory consumption and CPU/battery consumption), and because they don't behave like native apps in many ways. Slack is actually a great example in this regard: I'm only in one channel and that channel only has something like 50-100 messages per day, yet the four Slack processes combined consume a total of 780MB of RAM on my Mac. That's pretty crazy for such a simple app. And if I look at Slack's "Average Energy Impact" in Activity Viewer, it turns out that only my web browser (which currently has 54 open tabs) is above Slack, and Slack's energy impact is as high as the next 6 apps combined. Yikes! I was hoping that Boostnote could be a The Archive alternative that I could recommend to Windows-using friends, and at first glance, it did look interesting. That's why I was particularly disappointed when I learned about it's shortcomings. Memory footprint is the only trait of Electron apps I'd complain. Some non-native user experience is of little concern to me, though. Auto-capitalization of the first letter of a new sentence. The memory footprint. The energy consumption. The non-support of essential (to me) macOS features all make Electron apps a pain to deal with. But, if they float your boat and you are happy with them, have at it.